Contractor J.D. 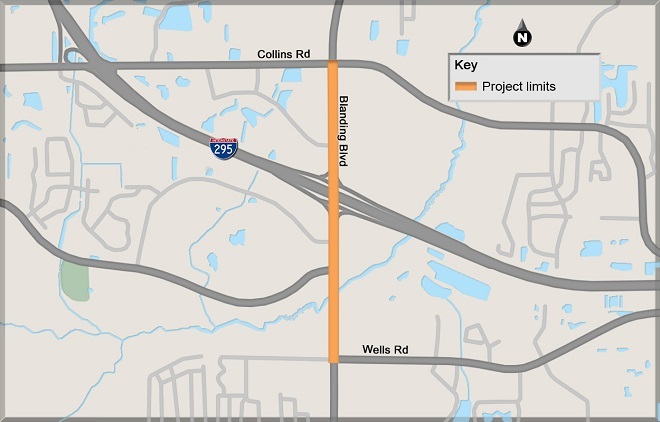 Hinson Company is expected to begin work January 3, 2019 on a project to install sidewalks and make other improvements to Blanding Boulevard (State Road 21) between Collins Road and Wells Road in Clay and Duval counties. In addition to adding sidewalks in this area, planned improvements include milling and resurfacing, base work, shoulder treatment, drainage improvements, curb and gutters, traffic signals, highway signage, guardrail, bridges and other incidental construction. Most project work will take place between 7 a.m. and 5:30 p.m. Monday through Friday. No lane closures will be permitted between 5:30 a.m. and 8 p.m., seven days a week. The current posted speed limit of 45 miles per hour will be maintained throughout construction. Traffic will be maintained in accordance with FDOT design standards throughout the project. When lane closures are needed, drivers will be alerted in advance via portable, changing message signs. Lane closure notices are available online at www.nflroads.com/trafficreport. The Florida Department of Transportation urges motorists to always follow the speed limit and stay within the limits of orange cones and barrels while traveling through construction zones. Call (904) 831-FDOT with any questions about this or other projects within FDOT District 2.